Suleiman II was the Sultan of the Ottoman Empire from 1687 to 1691 AD. He was born 15th April 1642 at Constantinople. Despite his short reign, he was able to strengthen the Ottoman state through internal reforms and reconquests of territory. During the reign, he issued gold, silver, and copper coins in the denomination of Akce, Ceyrek Kurus, Kurus, Mangir, Sherifi Altin, and Yarim Kurus. These coins were struck at Bosnasaray, Constantinople, Saray, and Van (Wan) mints. It depicted the Ruler’s name in Persian script ‘Al-sultan al-sulaiman bin al-ibrahim mulk-zarb-fi-Qustantuniya' and date on its obverse face. On the other hand, the reverse of a coin has Persian script 'Sultan-bin-wakhaqan-al-sultan-ibn-al-sultan', within a circle, surrounded by border. The above shown bronze Manghir belongs to his reign. 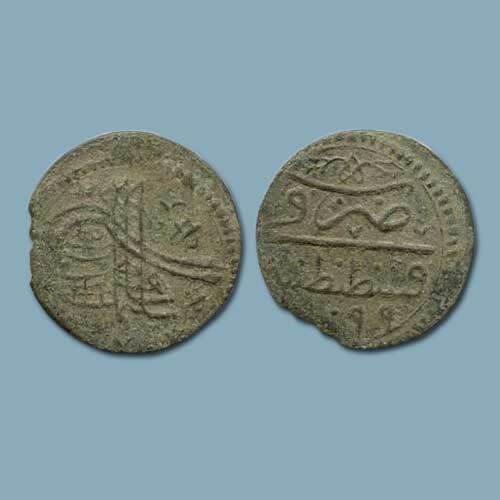 This coin was struck at Constantinople mint and depicted the beautiful Tughra inscription on its obverse.